But seriously, it does give you an extra day to get in on the Eckley Miners' Village Winter Wonderland photo contest, which has an entry deadline of March 1 (all the details you need). 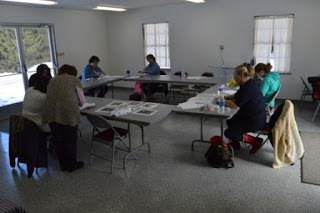 Somerset Historical Center has shared photos of their latest hands-on workshop, where participants learned about tole painting and decorated a wooden box to take home. 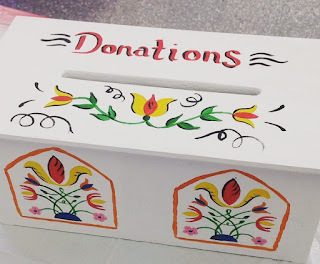 A staff project will stay at the site to accept donations to support this and other programs. If you're in the area (or like to travel), you might like the Pysanky egg workshop coming up on March 19. As you probably know if you're familiar with Ephrata Cloister, music was vital to community life historically and is an important component of the site's programming today. 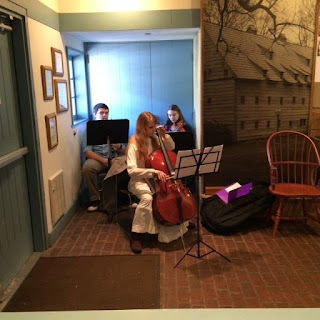 On two recent weekends, student musicians played classical arrangements of Ephrata music in the Visitor Center as a part of a senior project. [Smooth segue alert!] And speaking of students, 2015 summer intern Kendra Ressler recently participated in Ephrata's Winter History Class, sharing a report of her research project on an autograph album acquired for the collection (she wrote about it for Trailheads in August). 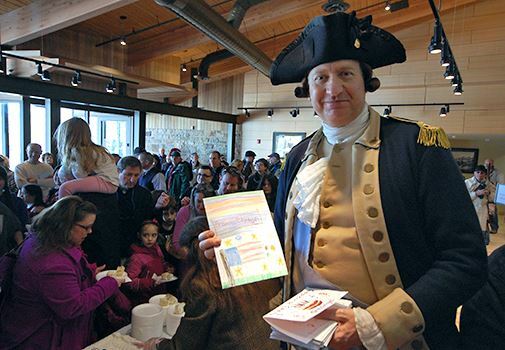 The annual celebration of George Washington's birthday took place last weekend at Washington Crossing Historic Park and it looks like a good time was had by all (photos on Facebook). It was recently announced that management of WCHP has been transferred from PHMC to the PA Department of Conservation and Natural Resources. The site remains part of the PA Trails of History. Wintertime is sail training time for volunteers at the Erie Maritime and U.S. Brig Niagara (named the top sail training program in the country for 2015). The museum recently shared photos on Facebook of trainees practicing seizings. Yeah, I had to look it up, too. And last but definitely not least. We recently received word that the visitor center expansion and new core exhibit at the Pennsylvania Lumber Museum will receive an Institutional Achievement Award from PA Museums at their annual conference in April. This was a major project that required the work of many people over many years, and we are really pleased that it is being recognized by our peers. Feb. 29: Storytime at the Maritime—children and their accompanying adult(s) enjoy a maritime-themed story and participate in a related activity. Program is free. 10 am. Feb. 27: Heirloom Seed Project workshops—sessions cover a variety of topics (visit website for class descriptions and registration info). Registration deadline was Feb. 19, so it may be filled. Feb. 26: Storytime at Curiosity Connection—the winter series kicks off with a reading of Roadwork, by Sally Sutton. The program also includes a related play activity and a visit to one of the museum's galleries. Included in regular admission. 10 am. Feb. 27-28: History Conference—Mrs. Boice's Historie Academie and the Friends of Washington Crossing Park will present a two-day conference, "Beyond Boom-Boom Sticks and Fancy-Dress Balls: Women's Lives in Early America." The program includes lectures and hands-on workshops; registration fee is $75 plus $15 per workshop. For more details and to register, visit Mrs. Boice's Historie Academie online. If you're like me, you spent last weekend indoors, glued to the couch, just trying to stay warm. Not that it wasn't productive. I knitted a hat, baked a batch of brownie-cupcakes, and got through the first season (and part of the second) of Gilmore Girls. That's me, always on the cutting edge of popular culture (at this time last year, my husband and I were binge-watching Mad Men to get caught up before its final episodes). So maybe you're looking for something to do this weekend. I've pulled some highlights from the February program listings to make it easier for you to decide what to do. You're most welcome. Feb. 21: Lackawanna Audubon Society—speaker Joe DeMarco will talk about "Birding in California." Program is free, but admission is charged to visit the museum’s exhibits. 2:30 pm. Feb. 21: Fireside Tales—children ages 4-8 and their families are invited to enjoy an afternoon of storytelling in the Wayside Lodge, with a reading of Go Ask the Wise Woman, an Irish tale told at night fires. Dress for the weather and bring an extra blanket if it’s really chilly. Hot chocolate and cookies will be served. Suggested donation, $2; regular admission is charged for touring the Boone Homestead and the historic area. 2 pm. Feb. 20: Something More Saturday—this month, the "something more" is the popular sledding party at historic Pithole. Refreshments will be available. Weather permitting and donations welcome. Start at the Pithole Visitor Center, 14118 Pithole Rd, Pleasantville, PA. 11 am-2 pm. This event was rescheduled from Feb. 13 because of the dangerously cold temps. They got more than a foot of snow earlier this week, so they should be good to go. Nevertheless, it's always prudent to check ahead to be sure. 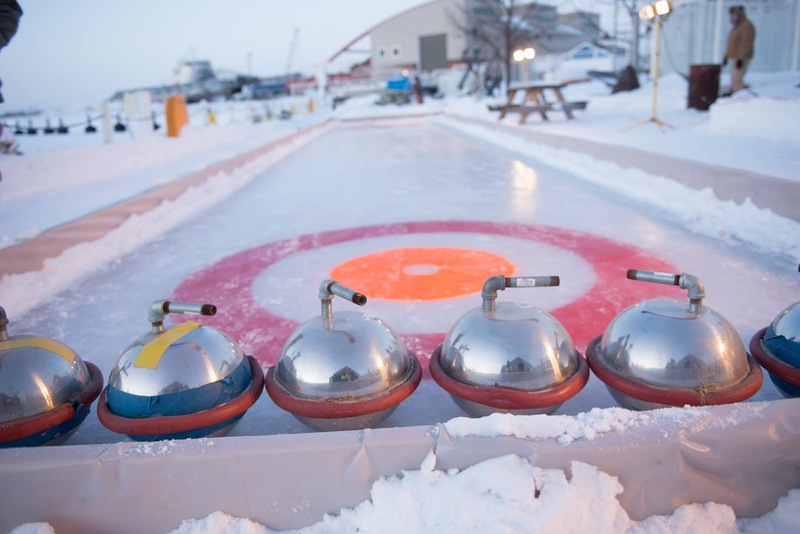 There will be curling at Erie's Wintertime at the Maritime! Feb. 19: Wintertime at the Maritime—shake those winter blahs with live music, heated tents, hors d'oeuvres, and adult beverages. Must be 21 or older to attend. Details on Niagara's Facebook page. 6-10 pm. Feb. 21: Lecture and Movie Series—the museum will show the new documentary A Good Ship and Crew Well Seasoned: The Fitzgerald and Her Legacy, produced by the National Museum of the Great Lakes (NMGL) to commemorate the 40th anniversary of the sinking of the SS Edmund Fitzgerald in Nov. 1975. Immediately following, Chris Gillcrist, executive director, NMGL, will present "Tales from the Cutting Room Floor" and take questions from the audience. Event takes place in the H.O. Hirt Auditorium, starting at 2 pm. 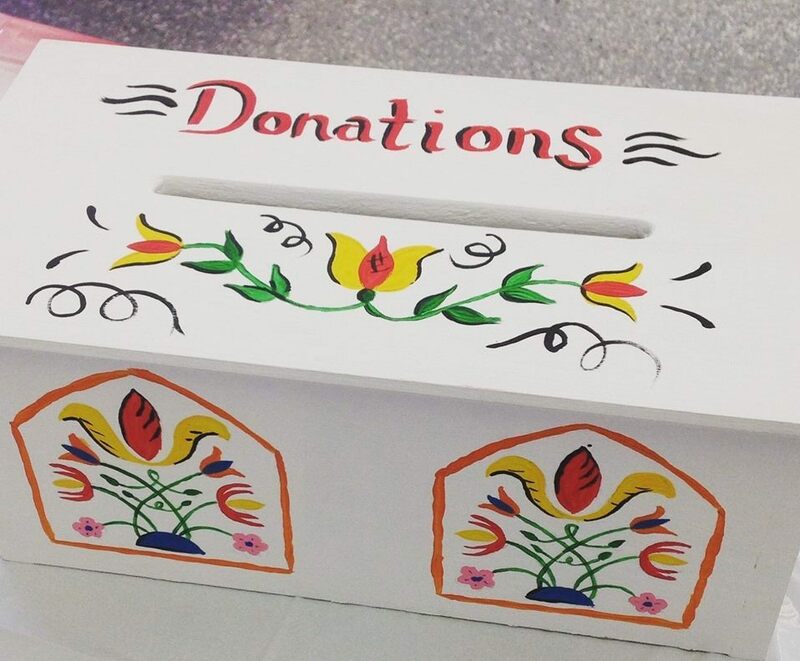 Feb. 20: Tole Painting Workshop—learn about this traditional technique and paint a decorative wooden box, inspired by one in the museum's collection. Cost is $30, $25 for members. Call 814/445-6077 to register. 10 am-3 pm. Feb. 21: Artist Conversation—tour "PA Modern: A Photography Exhibit of Midcentury Architecture" with exhibit co-curator Carol Buck and Preservation PA executive director Melinda Crawford. The tour will focus on the architecture of the State Museum and Archives Complex, as reflected in the exhibit (which runs through April 24). Included in regular admission. 2 pm. Feb. 20: Lecture and Book-signing—Fergus M. Bordewich will be on hand to sign and speak about his book, The First Congress. Bordewich's previous book, America's Great Debate, won the Los Angeles Times Book Prize in History. Admission to the event is $30 per couple and includes a copy of the book. Free admission for students and active or retired military does not include the book, but books may be purchased on site. Only books purchased on site or included in registration will be signed by the author at the event. Reservations are required - by calling 215/493-4076 or in person at the Visitor Center (open daily 10 am-5 pm). 4 pm. Feb. 21: George Washington's Birthday Celebration—children are encouraged to bring homemade cards for GW, who will be marking his 284th birthday. At 2 pm, the General will be on hand to receive birthday wishes and cut the birthday cake, which he will share with well-wishers. Admission is $1. 11 am-3 pm. Please be sure to visit the February program page to see what's up on the Trails of History. Fort Pitt Museum and the Railroad Museum of PA will be open on Presidents Day (Mon., Feb. 15); all other Trails of History sites will be closed. When I think of Valentine's Day, I think about my sweetie. And then I think about sweets (really, it's true). 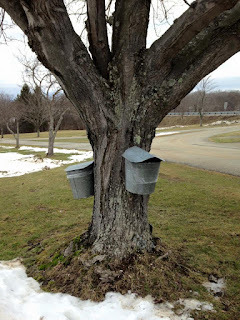 Somerset Historical Center has some great programs and exhibits related to maple sugaring, historically and currently important to life and commerce in Somerset County (and elsewhere in Pennsylvania as well). They were recently featured on the cover of Pennlines magazine (published by the Somerset Rural Electric Cooperative) and will be part of a maple-themed tour March 12-13, with lots of maple-related activities (and maple kettle corn, oh my). Or check out an article from Lancaster Online about a recent hearth cooking class at Landis Valley Village and Farm Museum. The article has lots of pictures of the sweets and savories baked by the students in the museum's outdoor bake oven. And we can't talk about Valentine's Day and sweets without talking about chocolate! At least I can't. For Charter Day, March 13, Daniel Boone Homestead will host presenters from Mars Chocolate Company's American Heritage Chocolate program. So, okay that's a month from now. You might want to get some chocolate to tide you over. A number of sites on the ol' TOH sell American Heritage Chocolate in their museum stores. Just a thought. I ran across a personals ad earlier this week: "Museum of lumber history ISO loveable bear that disappeared from parking lot. No questions asked. Just want you back." Seriously, though. The Pennsylvania Lumber Museum posted on Facebook this week looking for information about a large fiberglass statue of Smokey Bear that was unceremoniously chainsawed from its base (cut off at the ankles, actually) more than 35 years ago. At the time of the theft, there were no leads. The museum staff are hoping that through the power of social media, they may be able to turn up some clues. They'd like to at least know what happened to the statue, even if it's not recoverable. In the "Romance of Ruins" department (my motto: anything for a theme), RoadsideAmerica.com posted an article about Historic Pithole City earlier this week (or maybe reposted, since the director quoted in the piece retired several years ago). To grossly oversimplify, Pithole was an oil boomtown that sprang up and disappeared in the space of a few years. It is part of the Trails of History and is under the care of Drake Well Museum. If you can stand the cold, they're hosting a sledding party tomorrow (2/13), assuming there has been enough snow (if not, it will be moved to Feb. 20, so check ahead). UPDATE, 2/12/16: it's just going to be toooooooo cold tomorrow, so the sledding party is postponed until Feb. 20. Did you ever write the initials of your latest "crush" on the book cover of your math textbook? No? It's just me? Well, in 1835 16-year-old Amanda Degall embroidered the name and initials of her main squeeze, Matthew B. Rodgers, on a sheer muslin fichu (shawl) that is now in the collection at the State Museum of PA. Read more (including the sentimental lines Amanda also embroidered) and see photos on this week's PA Treasures feature. PA Museums tweeted a link to the Franklin Institute's Nerdy Valentines for 2016. Very cute (and there's a Ben Franklin electricity one, so that's history, too). It made me wonder if any history museums had created anything similar, but I wasn't able to find anything with a quick Google search. I did find some non-museum history-themed and very funny (some of them anyway) valentines, but they were NSFT (Not Safe for Trailheads). UPDATE 9:30 AM: Thanks to the folks at Washington Crossing, who shared the New York Public Library's Presidential Valentine Card page on FB. Things are gearing up for Museum Dance Off 3: Tokyo Drift, a music video contest run by the wonderful folks at the "When You Work at a Museum" tumblr. To find out more about submitting a video or to mark your calendar to start viewing and voting on entries in April, visit the contest page. You can watch the official trailer for last year's contest on YouTube. I'm including this because I love Museum Dance Off almost as much as I love chocolate (but not nearly as much as I love my sweetie). It's going to be very cold this weekend, campers. So whether you're snuggling up with a loved one, a favorite pet, or your Netflix subscription (or all three), stay warm and think about the Trails of History! What does the groundhog say? Please be sure to check out the February program listings to find your favorite Trails of History site. So, Groundhog Day (#GHD130) was Tuesday. You've probably heard what Punxsutawney Phil had to say, since he has a robust media operation. Lancaster County's Octoraro Orphie agreed with Phil that we should look for an early spring (they don't always agree). That's a good thing, in my opinion, since Winter Storm Jonas brought Lancaster County (where I live) all of its average yearly snowfall in one fell swoop (or swell foop, as one of my grandfathers used to say). 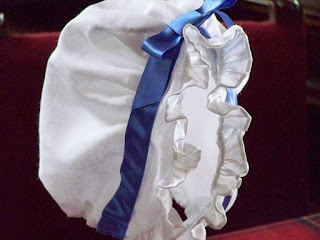 The folks at Somerset Historical Center had to delay their 18th-century cap workshop by a week due to the storm, but a small group gathered last Saturday to learn hand-sewing techniques while making an authentic cap. SHC will offer a tole painting workshop on Feb. 20, a pysanky egg workshop on March 19, and a weekend-long coopering workshop starting April 29.